COMMENTARY – The simple truth is that the Utes did not play well on Saturday and lost to a good Cal team. No one who was being realistic truly expected Utah to go undefeated this year, especially playing in the very competitive Pac-12 Conference. While at least one loss was expected, it was not necessarily expected last week. Let’s take a quick look at Saturday’s game, and then put it in context of the season overall. Reminiscent of the week before when the Trojans were able to move the ball at will against the Utes, gobbling up yards with big plays, the Golden Bears fairly flew down the field at the start. Cal took the opening kickoff and drove 75 yards in six plays to score a touchdown in 1:20 of play. The Golden Bears’ third drive also resulted in a touchdown after gaining 59 yards on five plays in 1:33 of play. Down by two touchdowns in the first quarter, Utah never quite recovered. There were plenty of problems that contributed to the loss. While turnovers carried the day for the Utes against the Trojans, the single interception against Cal was just not enough. Although the Golden Bears only ran 49 plays to Utah’s 97, Cal averaged 7.4 yards per play while the Utes only averaged 4.6. Utah was hindered by inevitable injuries on both sides of the ball. The coaches have to take some of the blame as well. You either have to get pressure on the quarterback or cover in the secondary, but when you can’t do either then something needs to change. While Whittingham didn’t mean to call a premature timeout in the crucial final minutes of the game, the lost timeout was a direct result of his conduct and was sorely missed when needed in the waning seconds of play. There were also some positives (just not enough). 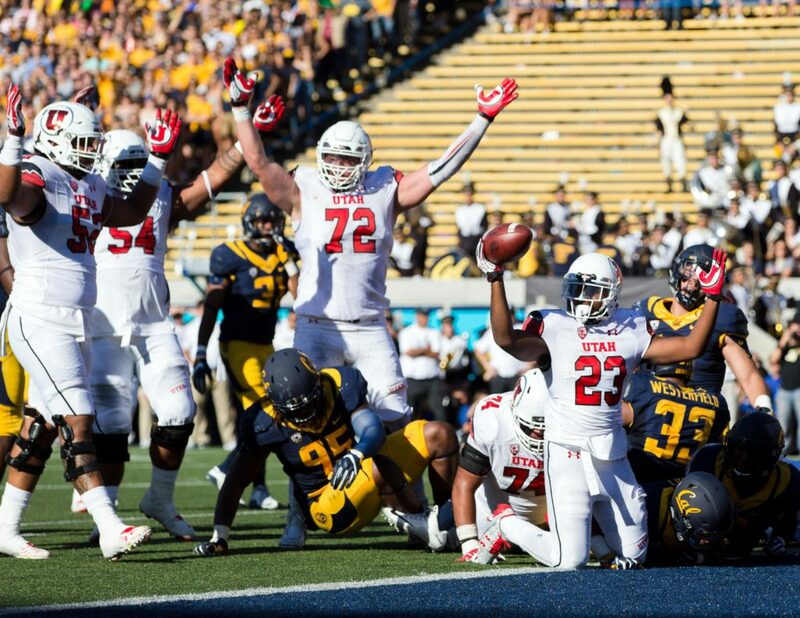 Cal averaged nearly 44 points per game the first four weeks of the season, yet Utah held them to a season-low 28. Utah’s offense aided the defense by controlling time of possession (42:01 to Cal’s 17:59), including a signature 95-yard touchdown drive consisting of 21 plays that chewed up 9:08 off the clock. Utah was also 4 for 5 on fourth-down conversions. In spite of less than stellar play throughout the game, the Utes still had a chance to win at the end, but just couldn’t quite get over the hill that had been built up during the course of the game. Was last Saturday’s loss the end of the season? Not even close. There is still a lot of football left to play. Even the national pundits still have Utah ranked 24th. Who would have thought that after two conference games Colorado would stand alone as the sole undefeated team in the Pac-12 South? Not me. The point is that the Utes still control their own fate. Because Cal is in the North division, Utah’s loss to the Golden Bears will not control a tie-breaker when it comes to deciding who represents the South in the Pac-12 Championship game. The Utes already own a critical tie-breaker against USC. If Utah wins out, then it will still win the South and play for the Pac-12 Championship. Will Utah win the remainder of their games? Highly unlikely. There are simply too many good teams left on the schedule. For that same reason, it is also unlikely any other team in the South is going to finish with less than at least one conference loss, with the more probable scenario being a two-loss South champ. The Utes still have road games against Oregon State, UCLA, Arizona State, and Colorado (currently ranked No. 21). Utah also hosts home games against Arizona, Washington (currently ranked No. 5) and Oregon. With respect to the conference as a whole, the Huskies appear to represent the Pac-12’s last hope of being relevant in the National Championship playoffs (although it is theoretically possible for a one-loss Pac-12 champ to still be considered). Ironically, it may be the Utes that spoil Washington’s national playoff hopes. That’s what happens in a conference with as much parity as the Pac-12 that insists on cannibalizing itself with nine conference games. Calm down, take a step back, take a deep breath, and get ready for an exciting remainder of the season. This Saturday, Utah hosts Arizona with an 8 p.m. kickoff on Fox Sports 1 in front of another national audience as Kyle Whittingham chases his 100th win as a head coach. Here’s hoping the Utes right the ship and hand the dean of Pac-12 coaches his 100th win at home on Saturday night.